When I was studying and working in labs, personalised medicine drew me in as a new methodology and innovative way to treat patients. Then, in 2015 a new term started to emerge – precision medicine. By 2016, precision medicine had usurped its personalised counterpart, becoming more widely searched on Google and illustrating a new direction for the industry (Figure 1). While some might say that this change in lexicon is merely a progression in language, I would argue there are differences in the two approaches to identifying and treating patients. Importantly, these two methods require diverse tactics when it comes to commercialising new products. Preventative: Intercepting the disease rather than tackling it once it becomes symptomatic – moving away from the ambulance at the bottom of the cliff approach to treating patients. Personalised: Developing and choosing medicines that will change the patient experience, from one of hope to one of certainty of response. Participatory: Taking a modern view of the diverse stakeholders who play a role in patient care now and democratising information so everyone can be informed. This definition points to two major themes – first, the universal requirement for data and second, testing to drive greater levels of precision. This data will come from a patient’s genetics, electronic health records, microbiome, diet, lifestyle, and will be the driving force behind improved outcomes. The rise of precision medicine will also call for a transformation in the use of testing to inform precise treatment choices, going beyond the standard blood tests and workups to bring the latest technology into the patient stratification process and optimise decision-making. This is where I believe the real difference between precision and personalised medicine becomes apparent and new commercial challenges come to the fore. 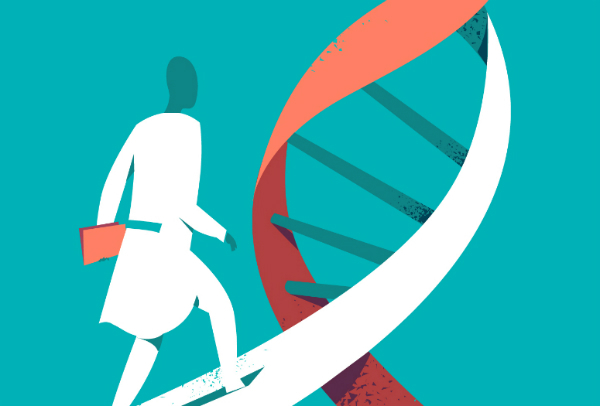 To really understand the opportunity of precision medicine, it’s important to answer two clinical questions on how a treatment choice occurs. In personalised medicine, we ask if we can use a particular treatment in a patient. However, in precision medicine, we ask what treatment is best for the patient? This will impact the way physicians’ view testing, using tests to inform the treatment choice rather than confirm it (Figure 2). Novartis and Roche are two champions of personalised medicine, shaping the area with the launch of targeted treatments combined with a companion diagnostic to support patient identification. These tests are the gold standard in personalised cancer care, they identify single point mutations, which correlate with drug response. However, they are fundamentally linked to a single treatment and, with a plethora of these targeted agents now available, a corresponding call for efficiency in testing has emerged. This begs the question: is it possible to do one test that covers numerous genetic abnormalities instead of doing numerous single tests? Parallel to the increasing number of testing options is the evolving taxonomy of cancer types. To date, cancer is diagnosed, treated and measured in relation to the organ of origin in the body. During the last few years, we have started to see a movement towards a new molecular taxonomy of oncology, which defines a tumour by its oncogenic drivers and matches treatment accordingly. Last year the FDA made a pioneering move in this space and approved Keytruda for use in adult and pediatric patients with unresectable or metastatic, microsatellite instability-high (MSI-H) or mismatch repair deficient (dMMR) solid tumours. The greatest difference between precision and personalised medicine lies in this transition to molecular diagnosis and testing, which can confirm not only patient eligibility but also identify relevant treatment. It creates a clinical situation where physicians can leverage test results to not only confirm a mutation but also to inform available treatment options, which could be outside the usual list of therapies the physician is familiar with. This sets out a clear need for treatment agnostic broad panel testing that provides physicians with a decision support mechanism. Foundation Medicine has risen to this need with the launch and approval of their new FoundationOne CDx™, the first and only comprehensive genomic profiling test for all solid tumours, which incorporates multiple companion diagnostics. In the US, the test will now be funded through Medicare for all patients, greatly changing the level of precision with which patients can be treated. However, outside the US is a different story, where the reimbursement landscape for testing is heterogeneous and internal pathology capabilities are often preferred. This presents an opportunity for the industry to engage and support the funding of testing. However, it also raises an important commercial question for the industry: does it make sense to invest more when the revenue and the number of patients are going down? In a recent analysis, Kelvin Stott of ‘Endpoints News’ outlines fundamental issues with the current pharma business model, where diminishing productivity and return on investment in research and development (R&D) is shrinking sales. With a lack of growth, sales start to contract, which reduces the amount of money available to invest back into R&D. If you consider the commercial viability of a precision medicine under this model, greater investment in services to identify patients could be seen as irrational. This is because the model relies on the number of patients treated with a product, rather than how well that patient responds to that treatment. Market reimbursement is driving the industry towards value-based care, which rewards patient outcomes rather than approving volume-based tenders for medicines. As a result, the industry is being pressured to develop more effective and efficient treatments, which can identify patients. However, to do this it needs help. No sector has been more successful at personalising their products while scaling efficiently than the tech industry, which is why it is no surprise to see its increasing activity in the healthcare arena, particular around precision medicine. In 2017, the second biggest area of investment in digital health was in the development of technology to support clinical decision-making. Tech companies like Amazon, Verily, Apple and Microsoft are all registering patents for healthcare tools or software as they seek to gain entry into the healthcare space. The rise in digital health innovation provides pharma organisations with a window of opportunity. By collaborating with technology experts to develop innovations, it will become easier to identify patients seamlessly and consistently. To get ahead in precision medicine, pharma will need to develop novel commercial strategies, which deliver value through measurable outcomes. Success will rely on optimising the patient experience at launch, rather than later in the life cycle; mapping the global testing environment and planning for diverse testing experiences; and partnering with tech companies that possess the data capabilities to drive efficiency. Liked this article? Want to learn more? Download our report on Precision Medicine and the changing pharma industry.